Over the last decade, the Citrix portfolio of solutions has dramatically expanded to include Citrix XenApp, XenDesktop, XenServer, XenMobile, Sharefile and Workspace Cloud. In addition, Flexwork and telework, BYOD, mobile workspaces, PC refresh alternatives and remote partner access are now common user paradigms that are all supported by Citrix technologies. To address this, environments need to be well architected but also well monitored and managed to identify and diagnose problems early on and prevent issues from escalating and impacting end users and business processes. 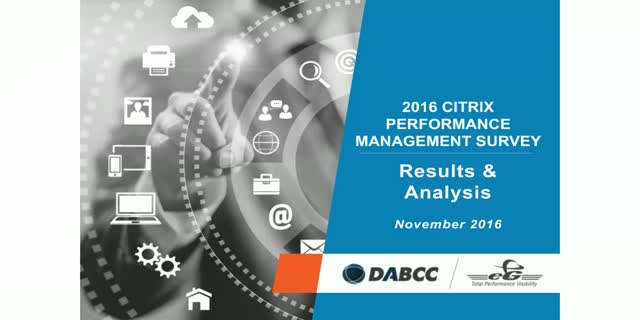 Join us for this webinar where Doug Brown, founder of DABCC, and Srinivas Ramanathan, CEO of eG Innovations, discuss the results and implications of the 2nd-annual Citrix Performance Management Survey which was designed to explore the current state of Citrix performance management to help Citrix users better understand current challenges, technology choices and best practices in the Citrix community. Troubleshooting slow application problems is one of the toughest challenges that IT organizations face in today's web-based, cloud-driven and dynamic environments. Given the distributed and inter-dependent nature of application frameworks, tracking just the application up/down status and basic CPU and memory utilization metrics is not sufficient anymore. IT administrators need visibility of the real user experience, code-level insights into transaction processing and real-time analysis of the health of the supporting infrastructure. IT transformation is less about going from one point to another than it is about making the whole greater than the sum of its parts. The historical fragmentation of IT monitoring limits visibility and transparency, often at critical times during a transformation journey. Join us for this ITSM Academy webinar where John Worthington, Product Management Director at eG Innovations will outline what IT transformation is all about, what IT monitoring is and why it's important to ITSM and DevOps as well as how you can leverage monitoring as part of a successful IT transformation program. Today, there are a multitude of ways to deliver applications to end users – traditionally via on-premise infrastructures, on mobile devices and from the cloud. With the growing diversity of services delivered comes increased complexity of interconnected platforms and their management. Join us for the webinar where Manjunatha Gali, Technical Marketing Manager at Citrix Ready, Bala Vaidhinathan, CTO of eG Innovations, and Giri Sonty, EUC Evangelist & CUGC NY/NJ Metro Leader, will discuss real-world performance management scenarios, how traditional troubleshooting and problem isolation are no longer sufficient in a multi-delivery, multi-client virtualized Citrix delivery environment, and the methods and capabilities you need to stay ahead. Organizations are looking for the right tools to monitor their Citrix farms. However, this is no easy task. There are several tools available in the market today - some from Citrix itself such as Director and NetScaler MAS, and others from third-party vendors like eG Innovations, Goliath Technologies, ControlUp, and more. Before investing in a Citrix monitoring tool, Citrix administration teams must be well-informed of what each of these tools is capable of, what use cases they serve, and their benefits and shortcomings. View (or join us for) this webinar as Rob Beekmans, Solutions Architect at PQR gives a vendor-neutral analysis of various monitoring tools with the objective of making you aware of the available options, and helping you choose the best monitoring tool for your Citrix deployment. Be informed, choose wisely! While there are many products that claim to provide cloud monitoring, the level of granularity provided by different solutions can vary significantly. But the devil’s in the details; the granularity provided by your performance monitoring solution will directly impact your ability to automatically diagnose performance issues before users are impacted. Join us for this webinar where John Worthington, Director of Product Marketing at eG Innovations discusses how managing private, public, and traditional data centers all together is no longer possible with multiple disparate monitors. Organizations must find a way to unify monitoring to successfully migrate digital business services to tomorrow’s hybrid cloud environments. With Citrix XenApp and XenDesktop being two of the most critical and performance-sensitive applications used in enterprise networks today, Citrix performance management is of vital importance for a positive user experience and business continuity. Join us for this webinar where we will discuss the top seven mistakes that IT professional make when managing their Citrix-based services as well as the best practices to address and avoid these mistakes to ensure positive user experiences and business operations. From pilot to production, eG Enterprise empowers enterprise organizations to deliver a better user experience and increased ROI by delivering comprehensive, converged performance management of Java application services. With optimized Java platforms delivered through Zing, Azul Systems enables Java-based businesses to focus on functionality and long-term lower operating costs rather than daily firefighting. Together, eG Enterprise and Azul Systems offer a proven Java environment designed to optimize the deployment, management, and scale of Java application services. What leaves visibility gaps and demands higher levels of time and expertise from IT professionals? Having different consoles for application code visibility vs. IT infrastructure management. The convergence of application and infrastructure monitoring offers significant opportunities to drive IT transformation using IT service management, DevOps and/or a combination of both. Join us for this webinar, ‘Closing the Visibility Gap | How to Combine Application & Infrastructure Monitoring to Accelerate IT Transformation ‘, the first of a ‘shift-left’ series that will highlight how you can meet the emerging requirements across both the ITSM and DevOps lifecycles. IT performance management isn’t about monitoring CPU, memory or disk space any more. One of the toughest application performance challenges for any IT administrator is when a user says "my application is slow". You have to be able to quickly determine what the real cause of the problem is - is it in the network, the database, the application, storage? The fact that applications are using multi-tier architectures and being deployed in cloud and virtualized infrastructures only adds to the challenge. Join us for this webinar where Frank Ohlhorst, Enterprise IT Analyst & Consultant and Srinivas Ramanathan, CEO of eG Innovations, will discuss the best practices for troubleshooting and prevention so even before a user complains their application is slow, you can pinpoint exactly where the cause of a problem lies – ensuring quick resolution and a positive user experience. Choosing the Best Approach for Monitoring Citrix User Experience: Should You Monitor from the Network, Server or Client? A great user experience is key for the success of any Citrix application virtualization or desktop virtualization initiative. To ensure user satisfaction and productivity, Citrix administrators should monitor the user experience proactively, detect times when users are likely to be seeing slowness, pinpoint the cause of such issues and initiate corrective actions to quickly resolve issues, thereby ensuring user satisfaction and productivity. A key question is where should the monitoring of the Citrix infrastructure be performed from - the network, the server infrastructure, or from the client?